A mountain is a large landform that rises above the surrounding land in a limited area, usually in the form of a peak. A mountain is generally steeper than a hill. Mountains are formed through tectonic forces or volcanism. These forces can locally raise the surface of the earth. Mountains erode slowly through the action of rivers, weather conditions, and glaciers. A few mountains are isolated summits, but most occur in huge mountain ranges. Whether a landform is called a mountain may depend on local usage. Mount Scott outside Lawton, Oklahoma, USA, is only 251 m (823 ft) from its base to its highest point. 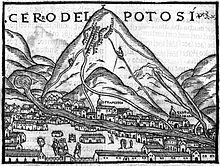 Whittow's Dictionary of Physical Geography  states "Some authorities regard eminences above 600 metres (2,000 ft) as mountains, those below being referred to as hills." There are three main types of mountains: volcanic, fold, and block. All three types are formed from plate tectonics: when portions of the Earth's crust move, crumple, and dive. Compressional forces, isostatic uplift and intrusion of igneous matter forces surface rock upward, creating a landform higher than the surrounding features. The height of the feature makes it either a hill or, if higher and steeper, a mountain. Major mountains tend to occur in long linear arcs, indicating tectonic plate boundaries and activity. Volcanoes are formed when a plate is pushed below another plate, or at a mid-ocean ridge or hotspot. At a depth of around 100 km, melting occurs in rock above the slab (due to the addition of water), and forms magma that reaches the surface. When the magma reaches the surface, it often builds a volcanic mountain, such as a shield volcano or a stratovolcano. Examples of volcanoes include Mount Fuji in Japan and Mount Pinatubo in the Philippines. The magma does not have to reach the surface in order to create a mountain: magma that solidifies below ground can still form dome mountains, such as Navajo Mountain in the US. Fold mountains occur when two plates collide: shortening occurs along thrust faults and the crust is overthickened. Since the less dense continental crust "floats" on the denser mantle rocks beneath, the weight of any crustal material forced upward to form hills, plateaus or mountains must be balanced by the buoyancy force of a much greater volume forced downward into the mantle. Thus the continental crust is normally much thicker under mountains, compared to lower lying areas. Rock can fold either symmetrically or asymmetrically. The upfolds are anticlines and the downfolds are synclines: in asymmetric folding there may also be recumbent and overturned folds. The Balkan Mountains and the Jura Mountains are examples of fold mountains. Block mountains are caused by faults in the crust: a plane where rocks have moved past each other. When rocks on one side of a fault rise relative to the other, it can form a mountain. The uplifted blocks are block mountains or horsts. The intervening dropped blocks are termed graben: these can be small or form extensive rift valley systems. This form of landscape can be seen in East Africa, the Vosges, the Basin and Range Province of Western North America and the Rhine valley. These areas often occur when the regional stress is extensional and the crust is thinned. During and following uplift, mountains are subjected to the agents of erosion (water, wind, ice, and gravity) which gradually wear the uplifted area down. Erosion causes the surface of mountains to be younger than the rocks that form the mountains themselves. Glacial processes produce characteristic landforms, such as pyramidal peaks, knife-edge arêtes, and bowl-shaped cirques that can contain lakes. Plateau mountains, such as the Catskills, are formed from the erosion of an uplifted plateau. Note that the presence of water in the atmosphere complicates the process of convection. Water vapor contains latent heat of vaporization. As air rises and cools, it eventually becomes saturated and cannot hold its quantity of water vapor. The water vapor condenses (forming clouds), and releases heat, which changes the lapse rate from the dry adiabatic lapse rate to the moist adiabatic lapse rate (5.5 °C per kilometre or 3 °F per 1000 feet)  The actual lapse rate can vary by altitude and by location. The effect of the climate on the ecology at an elevation can be largely captured through a combination of amount of precipitation, and the biotemperature, as described by Leslie Holdridge in 1947. Biotemperature is the mean temperature; all temperatures below 0 °C (32 °F) are considered to be 0 °C. When the temperature is below 0 °C, plants are dormant, so the exact temperature is unimportant. The peaks of mountains with permanent snow can have a biotemperature below 1.5 °C (34.7 °F). Altitudinal zones tend to follow a typical pattern. At the highest elevations, trees cannot grow, and whatever life may be present will be of the alpine type, resembling tundra. Just below the tree line, one may find subalpine forests of needleleaf trees, which can withstand cold, dry conditions. Below that, montane forests grow. In the temperate portions of the earth, those forests tend to be needleleaf trees, while in the tropics, they can be broadleaf trees growing in a rain forest. 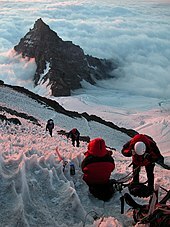 The highest known permanently tolerable altitude is at 5,950 metres (19,520 ft). At very high altitudes, the decreasing atmospheric pressure means that less oxygen is available for breathing, and there is less protection against solar radiation ( UV). Above 8,000 metres (26,000 ft) elevation, there is not enough oxygen to support human life. This is known as the " death zone". The summits of Mount Everest and K2 are in the death zone. The highest mountains are not generally the most voluminous. Mauna Loa (4,169 m or 13,678 ft) is the largest mountain on Earth in terms of base area (about 2,000 sq mi or 5,200 km2) and volume (about 18,000 cu mi or 75,000 km3). Mount Kilimanjaro is the largest non-shield volcano in terms of both base area (245 sq mi or 635 km2) and volume (1,150 cu mi or 4,793 km3). Mount Logan is the largest non-volcanic mountain in base area (120 sq mi or 311 km2). The highest mountains above sea level are also not those with peaks farthest from the centre of the Earth, because the figure of the Earth is not spherical. Sea level closer to the equator is several miles farther from the centre of the Earth. The summit of Chimborazo, Ecuador's tallest mountain, is usually considered to be the farthest point from the Earth's centre, although the southern summit of Peru's tallest mountain, Huascarán, is another contender. Both have elevations above sea level more than 2 kilometres (6,600 ft) less than that of Everest. - Wilson, Peter (2001). "Listing the Irish hills and mountains" (PDF). Irish Geography. Coleraine: University of Ulster. 34 (1): 89. doi: 10.1080/00750770109555778. Archived from the original (PDF) on 27 June 2013. ^ Lugo, Ariel E.; Brown, Sandra L.; Dodson, Rusty; Smith, Tom S.; Shugart, Hank H. (1999). "The Holdridge Life Zones of the conterminous United States in relation to ecosystem mapping". Journal of Biogeography. 26 (5): 1025–1038. doi: 10.1046/j.1365-2699.1999.00329.x. Archived from the original on 12 February 2013. ^ Daubenmire, R.F. (June 1943). "Vegetational Zonation in the Rocky Mountains". Botanical Review. 9 (6): 325–393. doi: 10.1007/BF02872481. ^ West, JB (2002). "Highest permanent human habitation". High Altitude Medical Biology. 3 (4): 401–407. doi: 10.1089/15270290260512882. PMID 12631426. ^ Moore, Lorna G. (2001). "Human Genetic Adaptation to High Altitude". High Alt Med Biol. 2 (2): 257–279. doi: 10.1089/152702901750265341. PMID 11443005. ^ Cook, James D.; Boy, Erick; Flowers, Carol; del Carmen Daroca, Maria (2005). "The influence of high-altitude living on body iron". Blood. 106 (4): 1441–1446. doi: 10.1182/blood-2004-12-4782. PMID 15870179.